Prof Oliver Turnbull (left) presenting Dr Kuan with his Teaching Fellowship.Bangor University has awarded a prestigious Teaching Fellowship to Dr Eric Kuan, President of the Management Development Institute of Singapore (MDIS) at a special ceremony. Teaching Fellowships are awarded by the University to individuals who have made an outstanding contribution to teaching. 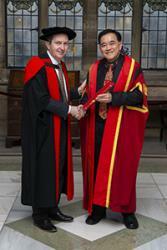 Dr Kuan has had an incredibly long and distinguished career in the university sector across many countries. He has held senior management positions in Manufacturing, in Materials and Logistics Management, and in Sales & Marketing roles, all within a range of American, British and Singapore-based multinational companies. Professor Oliver Turnbull, Pro Vice-chancellor, said: “Dr Kuan’s teaching is not only filled with passion and enthusiasm, but is also informed with practical examples and helpful anecdotes. MDIS is a Bangor University franchise partner (since 2013) that delivers Bangor University degree programmes in Singapore for both undergraduate and postgraduate courses within the School of Business. Founded in 1956, MDIS is one of Singapore’s oldest institute for lifelong learning and is one of the largest institutions with over 12,500 students. Dr Kuan has been working with Bangor University for several years, strategically in helping developing Bangor’s shared offering in Uzbekistan, sustaining Bangor’s partnerships in Singapore, and most recently, helping with new a plan in Malaysia.